I received a comment on an older post concerning Great Pyrenees (like our beloved Lydia). "I know this is an old post but it has stuck in my mind. We are about to close on a 15 acre property and I was thinking that a Great Pyrenees might be a good dog for us. In rereading this, I think maybe it would be more than we could handle as we've never had a dog before. Do you know of any other breeds that are great with children but would also make a good guard dog? I don't think a lab would fit the bill for the guard dog." I thought I'd put this up for general discussion to help this person out. What's a good guard dog breed which is also great with children? Keep in mind he/she has never owned a dog before. I have always been a dog owner. My first question is, will you have any other animals? Some dog breed that would make great companions for children and good guard dogs or lousy with other animals. We cross fence our acreage so we have gotten around that problem. My favorite dogs over the years, each breed for a different reason: queenslands (pure and mutt), labs, Italian mastiff. All 3 breeds have been easy to train, loyal, and good with our daughter (autistic, think Temple G.) We will be moving from CA to ID to about a year. We are looking into some other LGD breeds for when we get there. I would suggest that just about any dog can make a good guard dog, it is all in how you raise them. I have had experience with some fabulous breeds though and think the boxer is an excellent dog with children and with guarding. The only draw back I can think of with a boxer is that they can be gassy:-) I currently own two American bulldogs that are fantastic with my 7 kids and guard my property and livestock very well. My male bulldog, however, is quite large at 100 pounds. Boxers and bulldogs are smart and very trainable. The key is working with them a lot!!! Good luck! I hope you find a perfect dog for your family! I had a boxer as a kid. They are totally awesome! We have a Boxer. She is the gaskets dog I've ever owned. And we feed her dry food since we got her at 3 months. Beautiful dog though and loyal too. The American Bull is a great breed. We had one for 9 years. Calm, happy to be either on the couch or in the yard, did not need much exercise but was happy to up the energy level if someone else initiated it. people who didn't know her were kind of scared of her- which was fine with me. She was very gentle, about 90 pounds. Haha! Way to think positive! I know they're feared by some, but our best guard dog was a neutered pit bull female that we rescued. She was calm and loving, patient with the children, and patrolled our property regularly. She was the ultimate farm and family dog. We miss her! Do they want a dog who'll bark (and thus potentially warn off intruders) and warn their owner of said possible intruders? Or do they want a dog who's capable of determining actual threat, warning off said threat, and handling said threat if it doesn't warn off, and will be safe have around livestock and will bond with said livestock? If they just want the first type, almost any decent sized dog will do. And there's a fair number of herding and retriever types who are personable friendly easy to train dogs of good size with a loud bark. If they want the 2nd then they really need to go with a Livestock Guardian type. And of those the Pyrs are generally considered the easiest to manage. We have had many different breeds over the years, from a Sheltey to a Mastiff. I agree with the above comment that upbringing is the key to how a dog interacts with children and is protective of the entire family at the right time. I think the most loving and protective dog we have had is a German Shepard/ Collie mix from a shelter. Think about the coat the dog will have too - if it's to be outside a lot and doesn't have a thick coat that can be a problem in the cold weather. I just went through the heart break and expense of having a dog that turned into a chicken (and other bird) killer. Had her from a pup and just couldn't get this instinct trained out of her. She was a German Sheppard/Chesapeake cross. She also didn't like children. Fortunately I found a home for her with a single guy that takes her mountain biking and hiking - no kids, no chickens. Some breeds of dogs are more prone to be chicken killers than others - do your homework. At one time I had a dog like Lydia, half Pryenees and half Kuvasc, only problem with him was his idea of our property boundaries was about 20 acres BIGGER than it actually is. This type of dog thinks for its self I found. All of my dogs at some point have killed a chicken or duck. I was able to train that out of them, although I guess some are more difficult than others. Usually they wanted to *play* with a chicken while they were still young. That never works out well for the bird. I wish it had just been "a" chicken this dog killed - she wiped out the entire flock that was just coming to point of lay. A couple of months prior she'd killed a goose. I tried working with a trainer, right here on the farm. I didn't feel I would ever be able to trust her after she went on the rampage and killed the flock. She kept nosing around all the fences trying to find a way back in to the other birds (turkeys, geese/ducks) - so was very pleased when she was able to go to a young man who had a completely different lifestyle. We adopted a blue heeler puppy from our local shelter when we moved out onto our acreage. He is wonderful with the kids and the goats. And chases away any animal that tries to come on the property (except the neighbors dog, they have playtime). We couldn't be more happy with our choice. I can't speak too much about breeds in specific but unless you have the proper amount of open space around your home and property I have seen some big problems with breeds like the Pyrenees. Those dogs just don't understand easements and access rights and far too often around here after they became so popular people got them and they began patrolling property that was not theirs to guard. One time in particular after a heavy snow storm I had to slog through a couple feet of snow almost a quarter mile on foot while being harassed by a couple of Pyrenees who were not on their own property but well within their natural security zone. Just so I could remove the heavy snow from my bee hives. Owning a highly protective guard dog breed requires some responsibility from the owners as well and a bit of reality in looking at how your property is set up for one. Too many people with a 2 acre lot around here want one and the dogs just don't understand what's theirs and what is not. My favorite is Australian Border Collie. They can be trained to leave the chickens alone, while helping to heard cattle and get the horse in the trailer. They love ranch work., and love their family! Bear in mind they are energetic, and may try to 'herd' a pack of kids playing in the yard. You have to train them not to. If you don't find something for them to guard, they will find something on their own, I love them, but honestly you have to know what you're dong. Maybe the pound dog idea is the best one! Breed is important however training is the real issue. Are you really ready for a puppy? Possibly an older dog that from a breed specific rescue group would be better for first time owners on a new property with kids. Most of the time they can help with a dog that will fit in with your families requirements. I agree with this adamantly. When we bought our boxer I had no idea how intensive the puppy training would be. We ended up spending over a grand on training her a professional because she wanted to nip our youngest child. She is now 3 1/2 years old. Still very, very energetic but such a wonderful, loving dog. The only thing about our Boxer (we have a full bred Beagle too) is that she is extremely defensive of our family. Any outsider is looked as a threat. We still have not found a solution to this but husband doesn't really think we need to. We have 6 children so he is thrilled with the extra layer of security for our family. For a general purpose farm dog, guard and a first time owner with children, I would highly recommend a Bernese Mountain Dog. They are large, sweet, protective, gentle with kids and beautiful. For general farm guards, any type of Cur Dog is nice, Catahoulas, Black Mouth, Blue Lacey, but not really for a first time owner. A well bred Rottweiler is a great farm dog too. My personal favorite (and current breed) is the Belgian Malinois, but I do like a challenge! We just recently got a Malinois and are very happy with her so far. She is quite smart and behaves well around the children. She is only four months old so we have not seen all she has to offer. We are hoping she will be good with the chickens we plan to get in the spring. We currently have a Lab and a Newfoundland, which are both good at guarding our property borders and are fabulous with kids and other pets. The surprise was how good the Newf is at guarding, and even rounding up, the chickens and the goats. We recently had a goat that was in bad shape, and he would go out and just lay with her to keep her company. Our Newf now has cancer, and we won't have him for much longer, but we will definitely be looking for another Newf when that time comes. Flat coat retrievers are naturally protective of the family. When the gas man went in our yard and the dog was out there with my 5 year old alone, the dog nearly ate the gas man. There were threats of cutting off our gas until we got rid of the dog. I explained that the gas man should never enter a yard where children are playing alone. He should ring the bell and speak to the adult who is clearly at home. I also explained that I was proud of the dog. German shepherds, or a shepherd mix. Great, loyal dogs. They want to please you (so training is easier). They are very protective, and sound rather loud and scary to others. And they are amazing w kids. Our favorite breed! We have had Labs and German Shepherds. The Shepherd frightened some people just because of breed. She was small - 55 lbs - and a great "watch dog" as she watched people intensely never bothering anyone unless they acted aggressively toward a family member. (They knew she was there - like s shadow nearby...) The lab (male) is more aggressive ( I think his noise alone prevented someone from kicking in the house door a few years ago. They should have gotten in (damaged the door) but decided it might not work out well based on volume of bark. We were not at home. I can tell you that time spent training is a MUST for any dog or you will have the neighborhood menace and possibly a liability. Consistency - whether you are "training" kids, horses, dogs or other animals is HUGE. Bad manners is not the dog - it is the owner. We have a Rottweiler, mostly for a guard dog. She is now 6 months. We got her at 2.5 months and within 4 weeks we had her trained to come, fetch, down, stay and walk next to us off leash. She is so very smart, she plays by herself for hours with her toys, rocks, branches and other items she finds in the yard. We live on 12 acres and she always comes when she is called. She loves little kids and my 93 year old mother. We have never given her people food so she doesn't know how to beg. . We did a lot of research before we made the decision are are well pleased with our puppy. . She much prefers the cold to the heat in the summer. Searching for just the right puppy is fun - enjoy your search. Our lab makes a great guard dog and loves our children. Unfortunately, over the years, four people who did not belong on the property have our dog's teeth imprint on their hands and arms to mark the occasion. He lets us know when strange cars and trucks come on the property as well. He is a pack dog and protects his pack, but he listens well, he trained easily and loves our family. Or adopt a dog better yet. Training is much More important than the breed you chose.Make sure you research training and that you have the time to put into before you get your puppy. It really does depend on what they mean by "guard" - for guarding people, I'd go with a pit bull or a pit mix (my favorite crosses are pit / lab or a pit / beagle). So friendly and family oriented, but they can be true killers when the family is threatened. Also, there seem to be so many of them in shelters, it's a win win! Guarding livestock or property borders? I like my collie mix - very serious about patrolling the borders, good with the sheep, horses and chickens, and nothing crosses the property line without our knowing about it. One other poster noted how surprisingly protective the golden retriever can be - there is nothing better with kids, and while she is friendly and goofy for the most part, she has turned into a fierce dog when we are threatened. I am not sure she would maintain it in the face of a treat, but she has certainly scared people away. The Bullmastiff is a wonderful family dog. Mine was great with children, loyal to a fault, and a teriffic watch dog. Her looks frightened big men, but at heart she was one big sweetie with her family. Also, they tend to be home bodies and don't roam. I do not recommend German Shepherds for the new dog owner!! It is true they are smart, easy to train, and loyal. An excellent family dog, in fact. However, they do not suffer mistakes in their training and living conditions. There is a reason they are used by the police and military, imagine a dog like that that thinks he/she is the boss in your house - that is their default and must be dealt with in the right way. A lab or golden retriever's default is not to enforce their will when unintentionally mistreated or improperly trained. We had golden retrievers when I was a kid and my parents still have them to this day. The female retriever guards over may dad like a mother hen, she would die for him. They are a great first dog. A Bullmastiff is both great and gentle with children and one of the Greatest Gaurd Dogs in all history. They were known as the Gamekeepers dog and have the Genitic Dispisition to "seize and Hold Man by the arm or Wrist and Not harm him but hold him untill his owner told him to. Another Great dog for families is the Douge de Bordeu. They are tender Meatballs around family but Tresspass or threaten their beloved family and not even heaven and all its angles WITH hell and the devil himself combind will deliver you from their jaws. This may not go over well, but if you have never had a dog before, I would NOT suggest starting out with the idea that you should have a large breed guard dog/puppy. Way too many people do that with no idea what they are letting themselves in for, and when even the minimum amount of training and exercise and attention turns out to be far more than they bargained for, the dog is either rehomed (best case scenario) or put down as a menace (worst case) or left to fend for itself outside all the time. This is what my cousins ended up doing with their shepherd, before they finally "got rid of it." They had no experience with any animals at all, and they started out with a high energy, highly intelligent dog that was needed way more from them than they were willing to give. I'm still angry about the way he was treated. The best dog we ever had, we adopted when he was 10 years old. He was a 125# bull mastiff (small for the breed). He was old, tired easily, but still liked to go for walks around our 50 acres, great with kids, and had the deepest, loudest bark ever - which he only used when someone came to the door, or I tried to drink a Red Bull. He really didn't approve of Red Bull. He looked intimidating, but when anyone came into the house, he just leaned on them and waited for them to scritch behind his ears. If they wouldn't, he'd hmpf at them, and go lay down on his bed and stare at them with his sad eyes. Seriously consider starting off with a puppy of a smaller breed with a reputation for trainability, or a mutt from the pound, or adopting a geriatric large breed that is already a canine good citizen. I say that because the primary reason we adopted the old mastiff was to see if we could be a good large dog family. I figured he'd live 3 more years at most, and I could put up with anything for that long, and we would know whether we should take on the lifelong commitment to a larger breed than the sheltie/aussie mix we've had for years. It's the stupid things that can trip you up, too. The shaussie only ever needs brushing once a week or so, unless he rolls in something nasty. The mastiff needed a weekly bath or he stunk to high heaven of the fish-based dogfood he was on due to his chicken allergy. If he didn't get his bath, he'd start to itch, and he'd scratch himself by walking under the kitchen table and rubbing against it, picking it up and dragging it across the room. It's funny the first time, not so much when there are drinks on the table. It took several months to find the right bathing schedule and the right food, and the right meds to control his skin allergies. And the drool. Did I mention the drool? He's still the best dog I ever knew. I have av Great Pyrenees -Bernice. She is a wonderful guardian for our livestock. She is alert, trustworthy, and loving. I have 2 small grand children that run the pastures with her, and she is always gentle. They live in another state so she is not with them daily, and still is gentle. I have 4 house dogs (Scotties) that are on friendly terms with her also. The thing to remember if you own a guardian dog is that they "own" whatever is in their sniffing and walking domain. You your family, your livestock, your property,period. If you have need to introduce them to someone they also become part of their flock. I have had well diggers in my pastures, workmen, Vets, neighbors, never a problem. She always remember them,kindly. But strange animals, to include stray dogs are not looked on kindly. She maintains her property with dignity, and will defend her "flock" with unyielding performance. Strong fences are a must, and clear boundaries. I do not walkher outside her domain. When she goes to the Vet it is a single trip nothing more. We walk the fence lines together, and everyday I spend time with her grooming her, playing, and petting. She follows me when I am idling my chores. These are bright intelligent, lovable Giants, that take their jobs very seriously. They are blessing with a little stubborn mixed in. A joy, and a comfort. Bernice is a rescue and came to us at 2 yrs.,and little exposure to livestock, but in closing I have had no losses since her arrival, nothing moves into our pastures without advanced permission. Golden Retrievers are fiercely loyal to the entire family, are extremely intelligent, and are wonderful guard dogs. The added benefit is that they love to fetch, and will play for hours with anyone willing to throw for them. A word of advise, though. Kid and dogs need training. Kids need to be taught how to treat the dog. Bottom line (and wise words from a vet) is: any dog will bite, they just each have a different threshold or trigger. What would make a good child friendly guard dog? First of all you need to consider what you are guarding and what you are guarding against. Working dogs need to have a job to do to be happy. On small acreage in order to have any diversification at all you have to depend on good fences. Once stock is fully penned, a livestock guard dog has very little to do (unless you have a large population of bob cats that will jump fences), and will get into mischief to alleviate boredom. 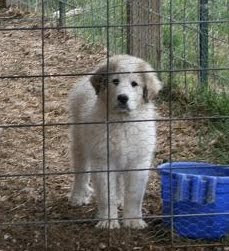 I maintain two Great Pyrenees to protect sheep and goats in a fenced 40 acres of woods and pastures. The area abuts the house so the close in areas also provide free range for my chickens. It took two years for the dogs to mature and be trained to the point where they became reliable guard dogs. I expect them to be past their prime as livestock guard dogs by the time they are eight and probably dead by nine. During the training period they had to be taught that goats, sheep and chickens were off limits but bob cats, coyotes, raccoons, possums, rabbits, squirrels and skunks were fair game and I did lose some stock during their learning curve. While they will bark at strange humans and vehicles, they are not at all aggressive toward human intruders and will readily accept humans if I am present. If you are protecting humans and property rather than livestock, for small acreage with kids I would recommend a mongrel from the local animal shelter and lots of love. Mongrels can be very loyal and extremely brave and vocal when protecting “their” humans and “their” territory. A mid sized dog is less costly to maintain and will provide an alarm/protection and companionship for 12 to 15 years. My vote would be an English shepherd... the original "farm collie". Smart, loyal, friendly, great with kids, and protective. I love labs and retrievers, but if you're going to have chickens, well.... they're bird dogs, after all! They *can* be trained out of chasing and killing chickens, thankfully. As a suggestion, a breed that is generally easy going and quick to learn is going to be the best choice for a new dog owner. Training is definitely going to be key! Good luck to them! Wow, thank you so much, Everyone! I appreciate all the feedback, the questions we hadn't taken into consideration, and the ideas. It's clear that you all love your canine friends and I look forward to having that love with one of our own. I think we have some serious talking to do as a family before we make any decisions!! An acquaintance has a pair of Great Pyrenees to guard her 'organic' sheep flock, and they do a good job. But, without a strong fence and gate, the dogs tend to wander off and neglect their duty. The people have fenced and gated their property but if a visitor forgets to close the gate, the dogs are out in a flash. Lovely dogs but they need minding too. We bought 8 acres about 2 years ago and a month later got a Pyrenees puppy. He is the best dog we have ever had. We ended up getting another one the next year. We have chickens, guineas, horses, and cats. None have been lost to predators. Pioneerpreppy is right though. This breed needs plenty of room and plenty of fences! They will take in surrounding propery as their own. do alot of research, shop around, and whatever you decide make sure that you get your training in on being a dog owner. make sure you want to make the committment first and foremost for any dog you might get. i have a chinese sharpei and a great pyrenees...training is important. so is the right kind of food and the right kind of yard, fencing, dog house, and attitude. owning a dog of any kind is a big responsibility. German Shepherd! Smart; loyal; protective; naturally scares "outsiders"; good with livestock/children; fun; did I mention smart! We like the old fashion straight back style (not the show type that have the steep angle) we happen to have 7 available! I am a professional dog trainer of 20+ years, have worked for a vet, and done a lot of dog rescue. It's nice to see someone doing their homework before getting a first dog! I would second the above comments recommending an adult rescue dog. Puppies can be a pain, as proven by all the "bad dog" memoirs out there. Adults have started to grow out of bad puppy behaviors and you can skip the rebellious teen phase of puppyhood. Rescuers are usually really motivated to make sure their placements last and they will work to find a dog that matches with your family and requirements. As for breed, it really does matter. No matter how much training, the breeds are not interchangeable. They were each created for a purpose and some are more manageable, especially for a new dog owner, than others. Boxers, mentioned above, are a nice family breed, good with children. They are also good at barking and being protective, without doing something that will get them put down and their owner sued. Same with beagles, although they can have a tendency to run away while following their noses. Mastiffs and bullmastiffs are nice family breeds, but will cost at least as much as another adult human to feed. In my experience, they are not that protective. Some in my acquaintance allowed burglars to walk right in while the family was away from the farm. Labrador and Golden retrievers are indeed good with kids if properly socialized, very happy and friendly. They do tend to be hyper until older. They aren't really protective either. My goldens have never met a person they didn't like, except my most recent. He is a poorly bred and poorly socialized rescue, and (over)protectiveness is just one of his more difficult to manage traits. A pit or pit mix from a reliable rescue can also be nice. They are great with kids, and people find them intimidating. However, many insurance companies will make your life more difficult if you have one. Same with Rottweilers. A terrier mix from the pound might also be nice- terriers can be protective and barky while having a high tolerance level for children and not usually trying to outthink their owner. Some breeds that I would steer a first time dog owner away from (and they are all breeds I have owned and loved, but they are challenging): Border Collies- I own & love them, but they are a pain! There is a disproportionate number of them in rescue. They are very smart and very energetic. If they don't have a job and exercise, they will invent their own, & you won't like it! They can be nippers/ biters (as can all the herders), can chase stock, and destroy your house. They have a lower tolerance for children, especially if the children are not very well behaved. They were "farm dogs" for a reason- they are a handful and people opted to let them run outdoors to keep the dog out of their hair. German Shepherds and the various Belgian breeds are also challenging for a new dog owner. They are also very smart, and as mentioned above, not so tolerant of sloppy training, owner mistakes, or owners who are not clear leaders. I have worked with many owners of these breeds whose dogs have taken over their lives, sometimes showing aggression when challenged. Australian cattle dog/ blue heeler- wow. I own one of these currently, and with all my experience I find him a handful. They are diabolically smart, primitive and very intolerant of poor training or wishy washy people. They are meant to be tough and think for themselves and they certainly do. They can be very protective of territory and children, but not necessarily in a way an inexperienced dog owner can handle. This dog will challenge your right to lead every day! Good training and leadership for your dog is important, no matter the breed. even if you are too far from training classes, at least check out YouTube and get books to give you a basic idea of how to train and handle the dog you choose. A good breeder or rescue should also be more than willing to help. Good luck! How to Choose a Dog. "Blood will tell," whether it flows in the veins of a horse, man, or dog. The reader can readily understand that it would be not only absurd but absolutely cruel to keep a Newfoundland, deer-hound, water-spaniel, pointer, setter, or any other similar breedof dog confined within the narrow limits of that small bit of ground attached to the city house and dignified by the name of a yard. It would be equally as absurd and almost as cruel for a farmer boy to try and keep one of those expensive, diminutive, delicate, nervous, city dogs known under the general title of a "toy dog "or "fancybreed." The agile, bright-eyed " black-and-tan," and the delicate and graceful Italian greyhound, are full of fun, but as unreliable as beautiful. Thoughtless, rollicking, exquisites! Such dogs are scarcely the kind either city or country boy would choose for playmates or companions. What most boys want is a dog that combines the qualities of a boon companion and a good watch dog. By the latter is meant a dogwhose intelligence is sufficient for it to discriminate between friend and foe, and whose courage will prompt it to attack the latter without hesitancy. It must also be a dog that may be taught to " fetch" and carry, to hunt for rat, squirrel, or rabbit, as well as to obey and trust in its master. It should be so cleanly in his habits as to be unobjectionable in-doors, and should possess judgment enough to know when its company is not agreeable, and at such times keep out of the way. The poodle is perhaps the best trick dog, but is disliked by many on account of its thick woolly coat being so difficult to keep clean. The wirey-haired Scotch terrier is a comical, intelligent animal, and a first-rate comrade for a boy. The Newfoundland is faithful, companionable, and powerful enough to protect children, to whom, if there be any around the house, it will become very much attached and a self-constituted guardian. The spaniel is pretty, affectionate, and docile. Almost all the sporting dogs make first-class watch-dogs, but are restless and troublesome if confined, and, as a rule, they are too large for the house. The shepherd is remarkably intelligent, and, when well trained, makes a trusty dog for general purposes. "The skilful dog-fancier contrives a judicious mixture of the two breeds, and engrafts the tenacity, endurance, and dauntless courage of the bull-dog upon the more agile and frivolous terrier. Thus he obtains a dog that can do almost anything, and though, perhaps, it may not surpass, it certainly rivals almost every other variety of dogin its accomplishments. In the capacity for learning tricks it scarcely yields, if it does yield at all, to the poodle. It can retrieve as well as the dog which is especially bred for that purpose. It can hunt the fox with the regular hounds, it can swim and dive as well as the Newfoundland dog. In the house it is one of the wariest and most intelligent of dogs, permitting no unaccustomed footstep to enter ' the domains without giving warning.'" Good with kids and family members, protective and determined...the Rhodesian Ridgeback. They are not fond of strangers except for kids until they look like adults. Great dogs and family members.